Enable Ecommerce on your website’s tracking. Modify the Matomo (Piwik) tracking code to track Ecommerce data, products, orders on your website. 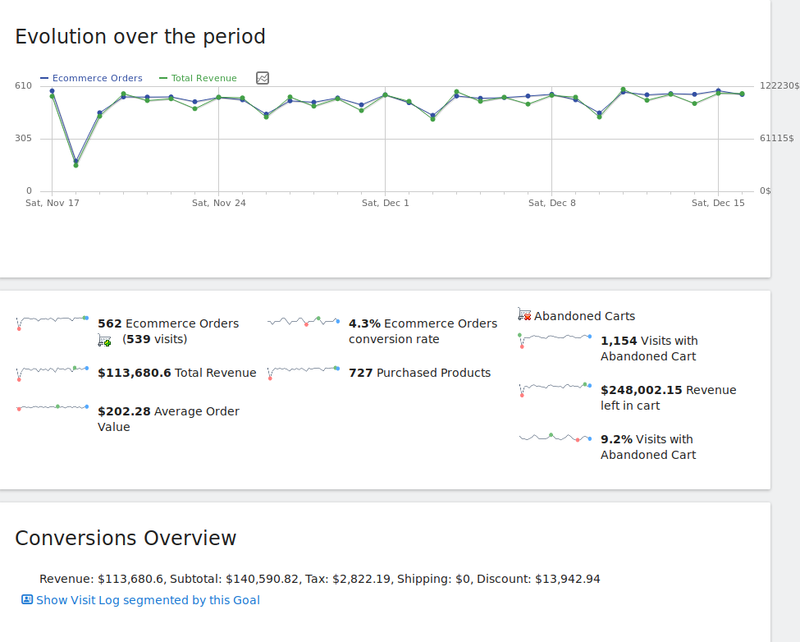 An overview of the Ecommerce analytics reports to help you understand and improve your online shop! Ecommerce reporting is disabled by default. 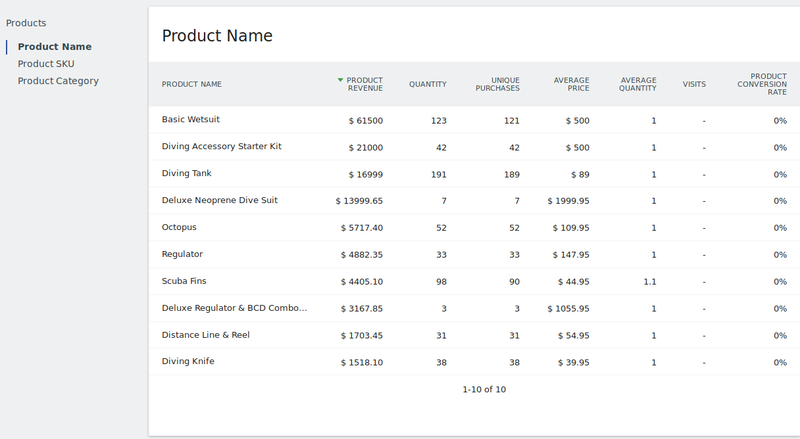 To enable Ecommerce analytics reporting, click on Administration > Websites, and select Ecommerce enabled from the dropdown in the Ecommerce column. Once Ecommerce is enabled for a website, the Goals menu will be renamed to Ecommerce & Goals and will display Ecommerce reports. If you do not see the Goals menu, it is probably because the Goals plugin is disabled. Go to Administration > Plugins to enable the Goals plugins. If your platform is not in this list, please consider developing an open source plugin to enable Ecommerce Tracking for the software you use. We would be glad to add it the Plugin List and have the whole community benefit! Matomo (Piwik) offers several useful and important ecommerce reports and metrics. In your Matomo interface, you can find Ecommerce reports by clicking on the main menu on “Ecommerce & Goals”. Assuming you have set up Ecommerce tracking as explained above, Matomo (Piwik) will provide the following Ecommerce reports. Ecommerce overview: revenue, orders, conversion rate, AOV (Average Order Value), etc. Existing reports will now include the “Ecommerce revenue” in the processing of the “Revenue” column. Pull out the information you need to make your Ecommerce business even more successful. It will only take you a few clicks with the Custom Reports premium feature. By default, Matomo (Piwik) will display the Ecommerce metrics for the selected date range, as well as a graph showing historical values for the selected metric. Matomo (Piwik) displays the list of Top Products sold, ordered by any of the Product metrics: Revenue, Quantity purchased, Unique Purchases, Average price, Average quantity, Visits or Conversion rate. You can get the top products reports by Product SKU, by Product Name or by Category. Note that you can access a help definition for each column by hovering on the column name. With Matomo (Piwik), you can view (in real time!) the detailed Ecommerce log, showing all visits that have made a purchase on your website, as well as all visitors who have abandoned their shopping cart with products left in them. Ecommerce sales by marketing channel is reported (for all channels, search, websites, campaigns, social), and useful metrics for each channel: Total revenue, average conversion rate, average basket revenue, number of purchased products, revenue per visit, and more. You can also apply attribution models to discover the true value of each marketing channel using the Multi Channel Conversion Attribution premium feature. You can see the historical performance of a particular Product, or a Product category. On the historical graph you can plot any of the key ecommerce metrics: Product revenue, Quantity, Unique Purchases, Visits, Average Price, Average Quantity, Product conversion rate. Existing reports will now display the Ecommerce metrics in column list, so that Ecommerce performance can be visualized in any existing report and not only in the Ecommerce report page. 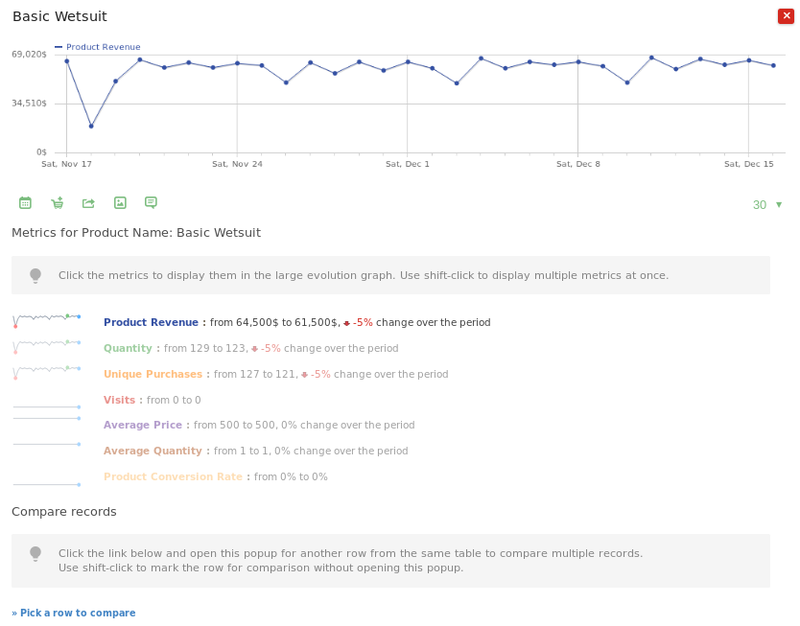 In the report footer, click the visualisation icon and click “Display a table with Ecommerce metrics”. Product (and/or category) page views. Top Product categories and general overview of Ecommerce performance in your online shop. This adds a product into the order, and must be called for each product in the order. productSKU is a required parameter, it is also recommended that you send other parameters if they are applicable in your Ecommerce shop. This tracks an Ecommerce order and sends the data to your Matomo (Piwik) server, for both this order and products previously added. Only orderId and revenue are required. orderId parameter is a unique string identifier for the order. If the page containing the trackEcommerceOrder() call is refreshed by the customer a few hours or days after the initial Order, Matomo (Piwik) will automatically discard the order as it is already recorded. You can use the same orderId for different Websites id, but for a given website, orderId must be unique. removeEcommerceItem(productSKU) – This removes a product from the order by SKU. You still need to call trackEcommerceCartUpdate to record the updated cart in Matomo. clearEcommerceCart() – This clears the order completely. You still need to call trackEcommerceCartUpdate to record the updated cart in Matomo. getEcommerceItems() – Returns all ecommerce items currently in the untracked ecommerce order. The returned array will be a copy, so changing it won’t affect the ecommerce order. To affect what gets tracked, use the addEcommerceItem()/removeEcommerceItem()/clearEcommerceCart() methods. Use this method to see what will be tracked before you track an order or cart update. Every time a visitor adds (or updates, deletes) an item from his/her cart, you can use Matomo (Piwik) to track the latest cart subtotal as well as products left in the cart. Tracking cart updates will allow you to see how much revenue was left in your visitors’ carts for each day/week/etc, as well as getting reports on which products are most often left in the cart and which product categories are most often left abandoned in carts. Also, you can visualize each visit and the content of the cart they abandoned in the Visitor Log. visitor was just browsing the site or wanted to compare total cost with competitor. When you make changes to your website to lower the cart abandonment rate, and try to increase your revenues, you can use Matomo (Piwik) to understand if your changes are making a positive impact. Tracking product page views, and/or category page views lets Matomo (Piwik) calculate the conversion rate for each product and/or category. It can be useful to know which product or category pages have converted your visitors into customers. For example, perhaps some product pages have below average conversion rates but generate high revenue. You may decide to improve these product pages and check their conversion rates over time. To track a product or category page view, the function setEcommerceView( productSKU, productName, categoryName, price ) is used, just before the call to piwikTracker.trackPageView() on the product/category page. All the data available in the User Interface Ecommerce reports is also available via the Matomo Analytics (formerly Piwik Analytics) API. You can easily request the list of products purchased on your site, either grouped by Product SKU, Product Name or Product Category. You can request these reports for Ecommerce orders, and also for abandoned carts. We hope you enjoy using Matomo (Piwik) to track your Ecommerce shop(s), and that Ecommerce analytics helps you to generate more revenue from your website, as well as keeping your customers happy. If you have any feedback or question about this documentation, please post a message in the Forums or in the feedback form below.